Even Your Kids and Spouse Will Eat It! Dehydrating broccoli is easy whether you're using fresh or frozen! Frozen broccoli is a great stand-in for fresh when it's out of season, as we all love fresh broccoli when it's tossed raw in salads or used as a dipper during summer! Avoid the solid blocks of frozen broccoli, buy the bags of loose florets instead. Did you know that broccoli has been around for over 2000 years and counting? Don't know if folk have been dehydrating broccoli for that long though! 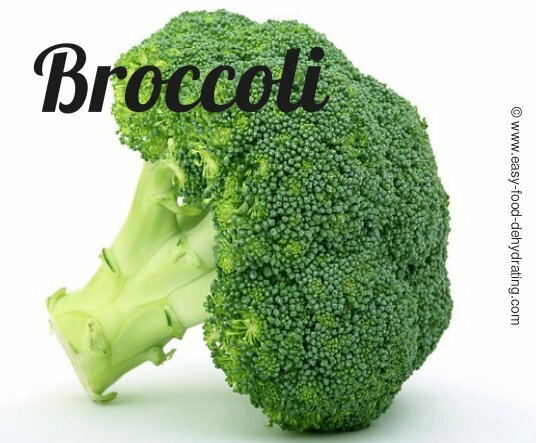 Broccoli is a good source of vitamin A, vitamin K, vitamin C, Folate, Choline and has trace amounts of Niacin, Vitamin E, Thiamin. Broccoli's minerals are Potassium, Phosphorus, Calcium, and Magnesium. Trace minerals are Iron, Zinc, Manganese, and Selenium. Broccoli also contains Omega-3 and Omega-6 fatty acids too. Dehydrating Broccoli ~ The Easy Way! If using frozen broccoli, ignore steps 1 and 2 coming up below. NOTE: if your frozen broccoli has clumped together in the bag, prior to opening the bag drop it gently on your counter-top a few times – this helps to loosen it up! 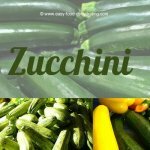 If you still have a few small clumps on your dehydrator trays, simply run the clumps under clean cool water for a few seconds, and that will do the trick! Or leave broccoli unopened in the bag in the kitchen sink for an hour, you will be able to slice the big florets very easily after that. Thoroughly wash your fresh broccoli. Cut into small florets. The broccoli looks like miniature bushes now! Blanch in a small amount of boiling water for about 2 minutes. Look how nice and bright the color is! OK, if they're too big, slice in half so they fit easily on your trays. Arrange the broccoli spears on your dehydrator trays, making sure they don't touch each other – give them some breathing room. Turn on your food dehydrator and set the temperature between 125°F and 135°F (or per your food dehydrator's instructions) and that's all there is to it! When your dehydrated broccoli is fully dried, it will be appear very brittle. Drying time for broccoli: between 6-14 hours. Please remember to rotate your dehydrator trays for evenly dehydrated broccoli florets. When dried broccoli is re-hydrated, it is superb as broccoli soup, as well as a souffle and works well as a sauce! How about broccoli with cheese! Yummy! And let's not forget to add broccoli in quiches too! 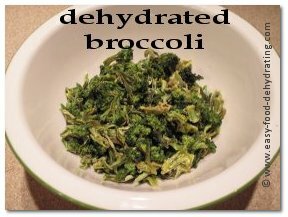 Granted, it isn't as good as fresh, but it's a close second ... and that's why dehydrated broccoli works well in soups and sauces. own broccoli, and eat the sprouts!